Habit: Annual, puberulent or stiff-hairy. Stem: erect decumbent, 1 or several from base, 0.2--1.5(3.8) dm, simple or branched. Leaf: basal not rosetted, early-deciduous, 2--10 cm, linear, entire, dentate, or pinnately divided into 2--10 lobe pairs; mid-cauline similar, smaller, entire, base tapered, not lobed. Inflorescence: compact, cylindric to head-like, elongated or not; rachis puberulent, hairs cylindric. Flower: sepals 1.1--1.4 mm, ovate; petals 1.9--3 mm, 0.8--1.3 mm wide, obovate-oblong, +- green, hairy abaxially, margin fringed; stamens 4. Fruit: 5--7 mm, 2.8--4 mm wide, oblong-ovate, tip winged, notch 1.4--2.8 mm; valve walls thick, with a mixture of long, much shorter hairs, strongly net-veined; style 0; pedicel 2.5--5 mm, strongly flattened, appressed, erect to +- ascending, puberulent throughout (only adaxially). Seed: 2--2.4 mm, oblong. Unabridged Note: Lepidium latipes var. heckardii differs from Lepidium latipes var. latipes solely on having stems elongated, simple at base (vs short and branched basally), but these 2 forms grow mixed in most populations. 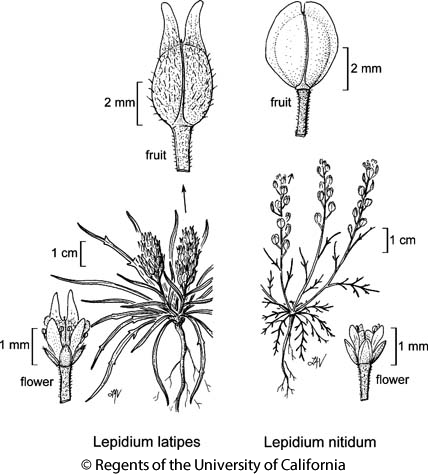 Citation for this treatment: Ihsan A. Al-Shehbaz 2012, Lepidium latipes, in Jepson Flora Project (eds.) Jepson eFlora, http://ucjeps.berkeley.edu/eflora/eflora_display.php?tid=30545, accessed on April 22, 2019. NCo, NCoR, GV, CCo, SnFrB, SCoRI, SCo; Markers link to CCH specimen records. Yellow markers indicate records that may provide evidence for eFlora range revision or may have georeferencing or identification issues. Purple markers indicate specimens collected from a garden, greenhouse, or other non-wild location.